Traveling and expating means that we have to/get to learn new ways to do things. We, however, like to think of it as a fun exercise in “mental stimulation” that AARP recommends to stem the onslaught of dementia. Each country we visit has a unique twist on how certain things are done and, despite how Urban Dictionary defines different as a “pseudo-polite way of saying something is unpleasantly weird or unacceptable,” we like to think that differences just are. And in Portugal, our list of “Not the Same As” keeps growing. Here are some basics. Language In Portugal, the official language is Portuguese. As we’ve looked through various books and online teaching classes we’ve learned that there are two variants: Brazilian Portuguese and the correct choice, European Portuguese. Here in our part of the country, the Algarve, most people speak English, a fact that has made us very lazy but here’s hoping that (someday) we’ll magically acquire the ability to twist our mouths and tongues into the acceptable shapes and pronounce suitable sentences in the correct tense. So far we’ve evolved from English to Spanglish to Portuglish. Money In the US the dollar ($) is king but in Portugal the euro (€) reigns. 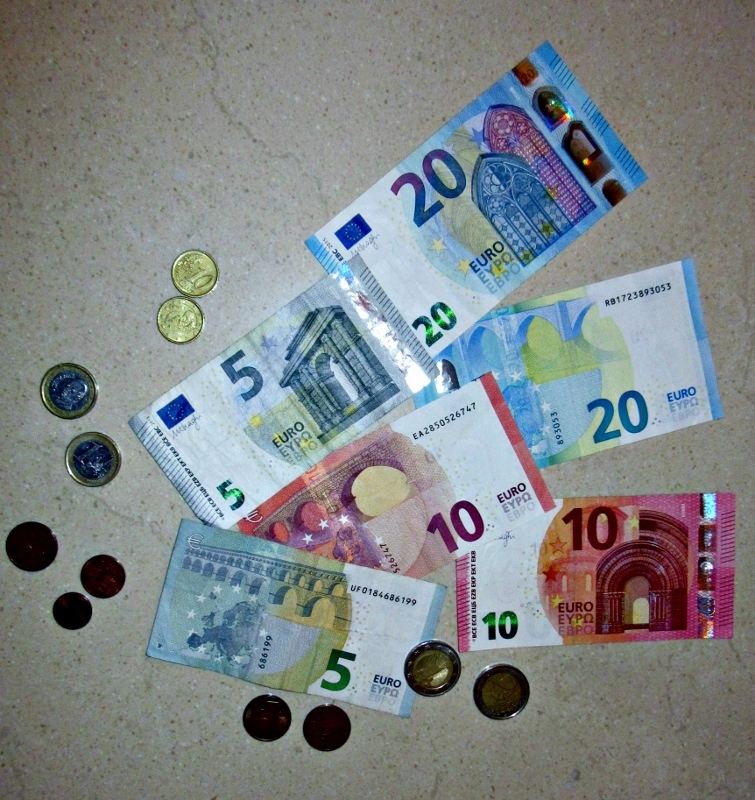 What we like are the bills which are different sizes and colors depending on the denomination and, rather than one euro notes, there are one and two euro coins. The downside is that your wallet can get very heavy, very fast. Right now, since the dollar is strong, the conversion rate is almost at parity with a euro approximately equal to $1.06 dollar. This means, with nineteen countries in Europe using the euro, travel is a pretty good deal right now. 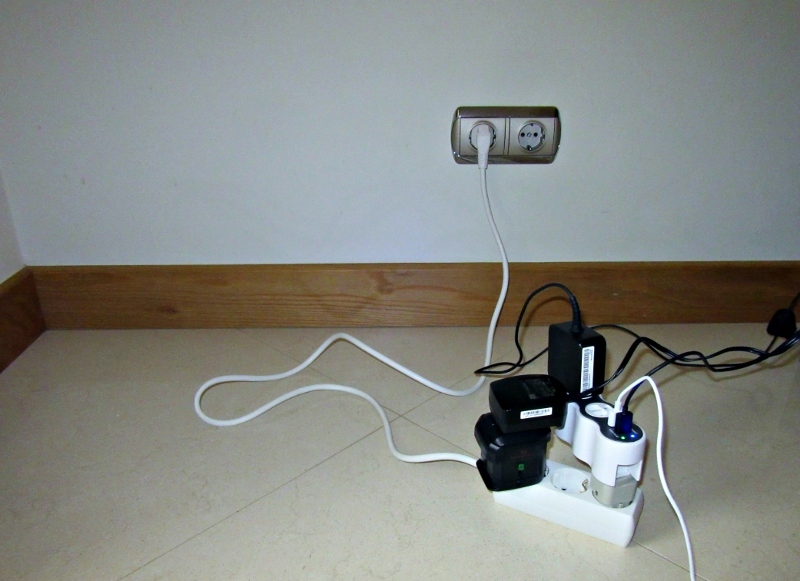 Plugs, sockets and adapters Like all of continental Europe, Portugal uses the Europlug, a two round pin plug for 220 – 240 voltage that fits into a recessed socket. Since most of our electronics are from the US, we have a variety of adapters that we’ve picked up here and there and, because our wall sockets are never quite enough or conveniently placed, we use extension cords. With our adapters, and especially with the surge protector on top, it makes for an inelegant and precarious tower. Measurements Growing up, we both remember hearing our teachers say that the United States was going to change over to the Metric System “any year now.” Decades later, that still hasn’t happened but we’re getting pretty darn familiar with the concept. Our weather forecast and oven setting are in Celsius versus Fahrenheit, our mileage is in kilometers versus miles, our drinks are in liters and our weight is in kilograms (so getting on that scale isn’t quite the shock it could be). Our home Forgive us for a sweeping generalization, but it seems that in Portugal and the parts of Europe that we’ve seen, everything is smaller, including the houses and apartments. The refrigerators are narrow and it’s common to have the refrigerated section on top and the freezer below. Washing machines are half the size of their American counterparts. There are no garbage disposals – or none that we’ve encountered. Dishwashers are rarely installed in older homes but are more common in newer, higher-end apartments or refurbished homes. And clothes dryers are even rarer – maybe because they’re expensive or because utility costs are high. We have a fold-up rack for drying our clothes, a few lines on our rooftop terrace and a good supply of clothes pins . And speaking of clothing care, ironing boards and irons appear to be in every hotel room and rental. In the stores, there’s a whole offering to the mighty iron. Instead of central heating, homes have heaters of many varieties and various efficiencies in selected rooms and doors to close off the warm areas from the cold. On-demand hot water heaters are the norm as opposed to up-right tank water heaters. Upright vacuums are rare and much more expensive than the canister types and we have yet to see a wall-to-wall carpet. It’s more common than not to see bidets in the bathrooms and let us tell you, we’re getting spoiled with our heated towel racks too. (Okay, heated towel racks probably aren’t common but it hasn’t taken long for us to get used to them.) And the beds … all we can say is, “Where are the box springs and pillow-top mattresses?” Beds are low, usually a mattress on a platform, which might be good for the back but less-so for the soul. Cars Cars are smaller too. Perhaps so they can wend their way through cobblestone roads designed for a donkey and cart without knocking off the side mirrors? (Of course, there’s no need to ask how we know that those side mirrors pop right back on when you do that, right?) And another thing. There’s a whole generation or two in the US who have no idea how to drive a car with a manual transmission but here’s a heads-up – get some practice. We’re not quite sure why but it costs more to rent or buy a vehicle with an automatic transmission – or it would if you could find one. Lucky for us, we hail from the generation that needed those shifting skills occasionally. But, speaking of skills, we’ve discovered that parallel parking is something we could both use a good refresher course on. Which bring us to – Gasoline. Portugal has both the self-serve stations and attendants who’ll help you feed the hungry beast or pick you up after you faint at the price. Because, in Portugal, gas prices are a whopping €5.60/4 liters which is roughly a gallon. And with OPEC back in the gas boycott business, prices may escalate soon. Garbage seems like a good place to end the first part of our “Not the Same As” list. 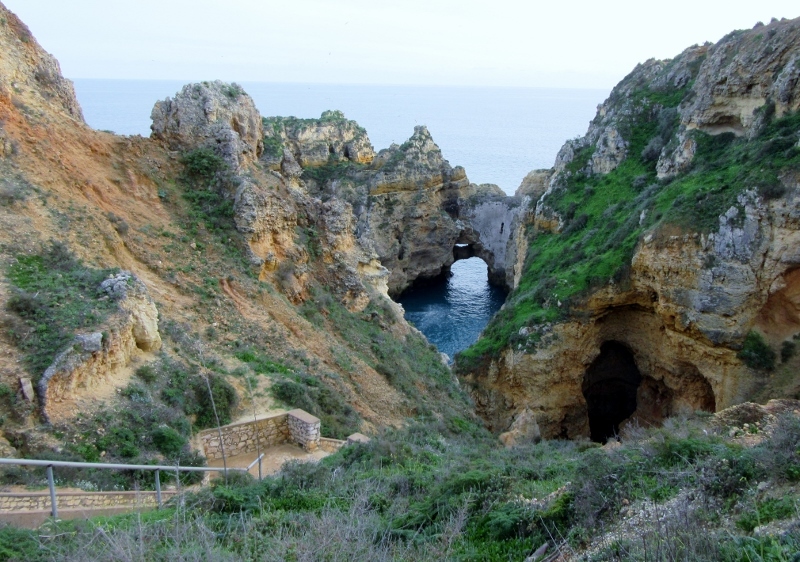 Next post we’ll continue and talk more about our daily life in Lagos, Portugal, including driving, shopping and entertainment (some say they’re the same thing 🙂 ) and small courtesies. To quote a couple of lines from singer-songwriter Jimmy Buffett, “It’s those changes in latitudes, changes in attitudes, nothing remains quite the same…” Here’s to the differences! We don’t usually think of ourselves as trend-setters. We left the US in 2012 with the plan to travel slowly and see where the road took us. We’d concluded the year before, in 2011, that the only way early retirement would be possible for us was to look at moving to another country where the cost of living was cheaper and the health care more affordable. We weren’t making any political statements as we traveled slowly from Mexico to Central and then South America with a couple of island nations thrown in for good measure. And how we ended up in Portugal wasn’t because we were disaffected with the US. However, judging from the dramatic increase in Americans inquiring as to how to move to other countries like Canada, (so many that the immigration website repeatedly crashed the night of the election of Donald Trump as the future President) we may well be ahead of a rising number of US expatriates seeking new lives elsewhere. 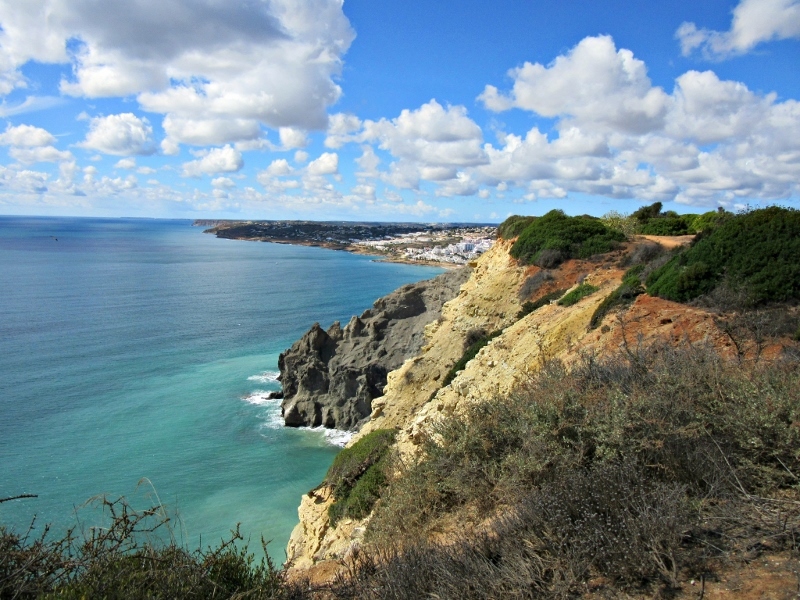 Along the cliffs between Lagos and Luz. Coincidentally, the increased interest in moving abroad has occurred on our first anniversary as Portuguese residents, living quite happily in the Algarve area of Portugal. It’s been awhile since we’ve talked about our lives in the small city of Lagos, what we’ve learned as we’ve coped with the cultural differences and figured out how, where and when to get things done. One of the most important things we did, after consulting our lawyer and giving our landlord the required 60-days’ notice, was to move. Turns out there’s a H-U-U-U-G-E difference in living out of a suitcase for three years and viewing each home as temporary versus renting a place with the plan to stay for a year or longer. Our small apartment at the Lagos Marina was iffy from the start and, over the five months we lived there, doable slowly changed to irritation, changed to the old movie line from Network, “I’m mad as hell and I’m not going to take it anymore!” Heaters were replaced and light fixtures repaired but we were still left with broken down, uncomfortable and stained furniture, the sound of late-night partygoers holding loud conversations outside our windows and the fact that we had about a foot of counterspace to prepare meals in our “efficiency” kitchen. And once we rented and later bought a car, the walkable location and proximity to the grocery store, city center, bus and train stations became much less important. 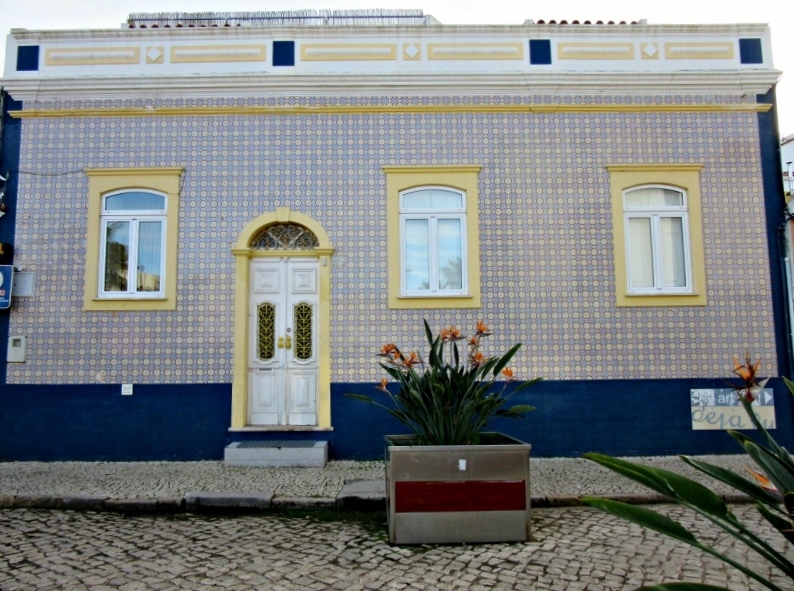 Finding a rental in Portugal. Unlike the US where rental companies and realtors share multi-listing services, it takes a little more effort and diligence to find a rental here. It’s not that there aren’t property managers, rentals or sellers out there – it’s just that their listings are exclusive. A renter or buyer goes from one representative to another and views different properties with different agents until they find what they want. 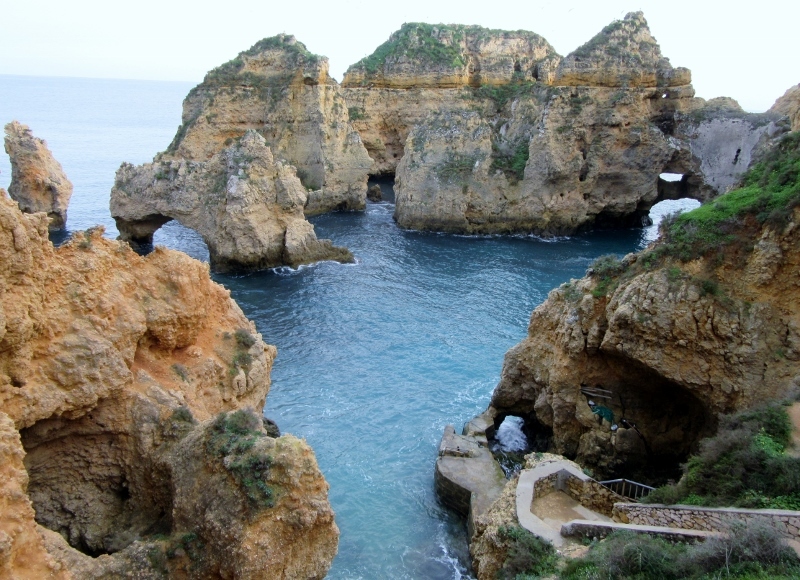 Another wrinkle in the Algarve and especially in Lagos, is finding a long-term rental versus a short-term rental (called a “holiday let” here) because this is a popular tourist area. The rents double and triple in June, July and August and many owners have a good income as well as the option of using their property as a vacation home. We’d made friends with one realtor during our time in Lagos and a new friend recommended another property manager so, in a classic case of the right time-right place circumstances and in the space of a week, we had two great places to choose between. 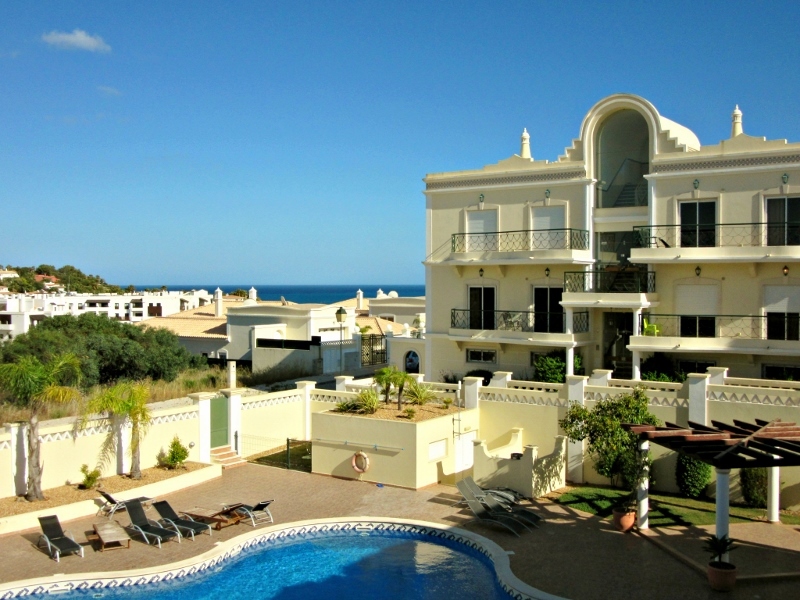 One was a 2-story, 3-bedroom, 2-bath townhouse/condo for €900 in the nearby town of Luz and the second choice was a very modern second floor apartment, 2-beds, 2-baths with a sea view on the outskirts of Lagos for €800. Both were furnished nicely right down to pans, plates, sheets and towels, had gated access with parking for our car and lovely pools. We opted for the second apartment with its granite countertops and dishwasher (only €50 more per month than our original rental) and, giddy with the feeling that we had a most excellent abode, forked over without any hesitation our first and last months’ rent. 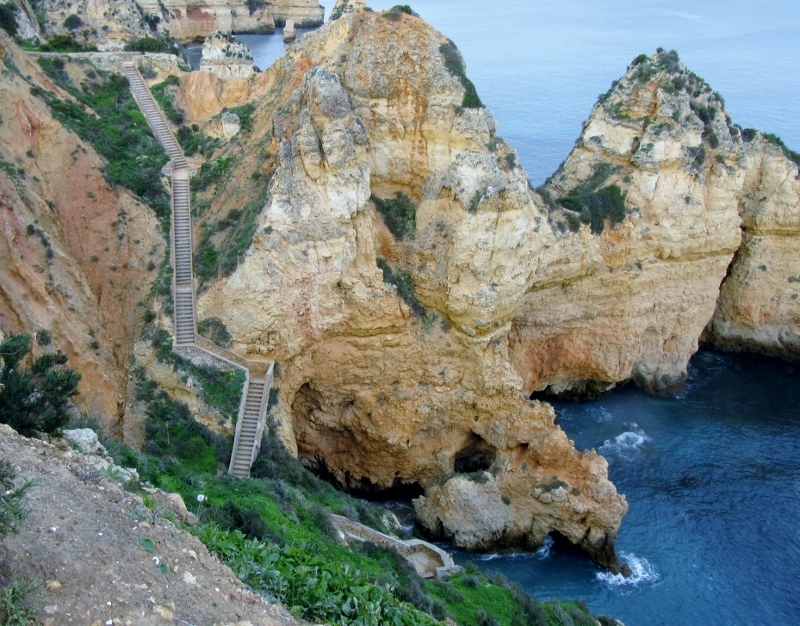 We’d moved to Portugal with three medium-sized suitcases, two carry-ons and two small backpacks. This time it took two car trips to schlepp our stuff, mostly kitchen items, a bulky printer-scanner, pillows and off-season clothing, Beverly Hillbillies style. What we learned. We should have rented a place month-to-month (Air BnB has some great choices) for the first one to three months while we looked for a good rental that better suited our taste and budget. It takes a bit of work to wriggle out of a long term lease. 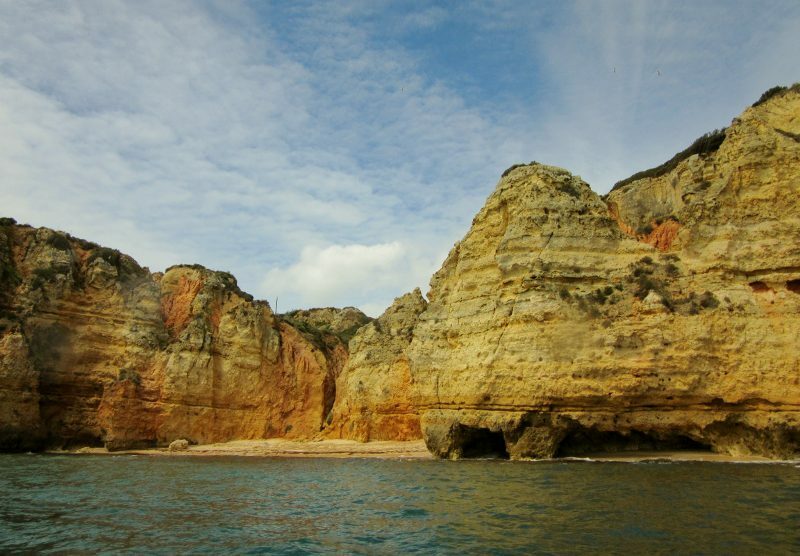 *If you’re thinking about the Algarve, start your search during the shoulder or off-seasons, September through May. You’ll save money and there will be more choices available. Keep in mind that living along the coast will be more expensive as is living in a popular tourist town like Lagos. *Rent a car by the day, week or month (the rates go down during low season) even if your plan is to be auto-free and pedestrian once you settle in. 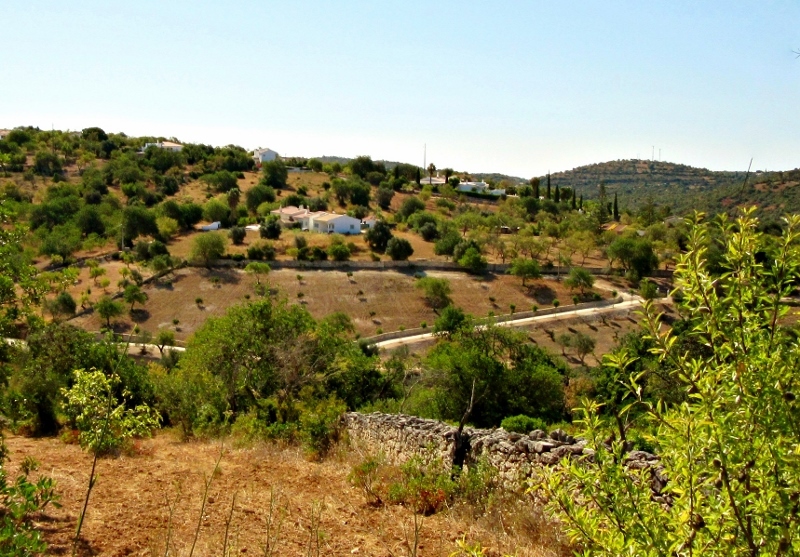 This will give you a chance, in your quest to find the right place, to explore the small villages scattered along the coast and inland which all have unique personalities and characteristics. *Don’t buy a property right away if that’s what your long term plan is. There’s a lot to choose from and no reason to rush. And, if we haven’t made it clear by now, our plan is to keep renting for the foreseeable future. We’ve been there – done that as far as owning property and we much prefer to keep our options open. In fact, we really can’t see too many reasons to buy property in a foreign country since the rents are so reasonable. Changing your address. Since we’d traveled for several years we’d gotten out of the habit of a having either a phone (when you’re new in town who are you going to call?) and mailbox. The ease of doing everything online and staying in touch by email is a no-brainer. *However, now we had a phone and internet/cable contract so we walked over to our service provider, MEO, to advise them that we were changing addresses and needed to have the cable moved to our new apartment. The new installation cost a whopping €100. Consider: In a foreign country, we always try to do things face-to-face to make sure we understand and are understood! Consider: If you’re going to rent short term, find a place that has wi-fi and cable TV (almost every apartment but the one we rented!) to avoid a package contract. Our new apartment had public Wi-Fi and cable so now our services are duplicated. On the upside, our total bill is only €54/month and our internet is private. Still, if you only have a phone contract, it’s much easier to update the address and pay the bill as an auto deduction from your bank. *We took photos of the water, electricity and gas meters of our old apartment on the day we moved out to give to our former landlord to change the utilities back to his name. The whole process of changing the utilities took a lot of patience and ended up with us feeling frustrated as well as feeling like we’d (most probably) been ripped off. Lesson Learned. Our new property managers gave us the option to keep the utilities in the owner’s name and we pay the bills online as we receive them which is much easier and more straightforward. As foreign residents, the most important people to tell about an address change is the SEF, Service de Estrangeiros e Frontiers aka the Foreigners and Borders Service – in short, the immigration authorities. 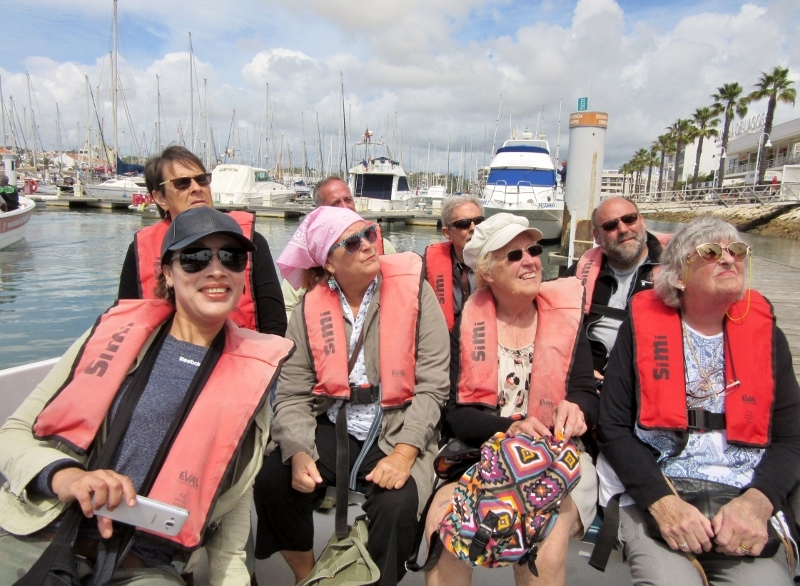 We stopped by the nearest SEF office in the city of Portimao where we showed them our new lease and address, forked over €40 each and had new photos (hurray, the new photos make us look less like fugitives but one of us is lacking a chin!) and fingerprints taken since SEF would issue a new resident card with our updated information. Another lesson learned. Make sure your address is complete. While our address was correct the original information we’d been given lacked our apartment number which meant the postman couldn’t deliver it. We waited and waited for our new resident cards to come, checked at the post office where they shrugged their shoulders in a polite but unhelpful way and finally went back to the SEF office to find out the cards had been returned. We picked them up and, next time, will make sure our new cards have the apartment number on them when we renew our resident visas. 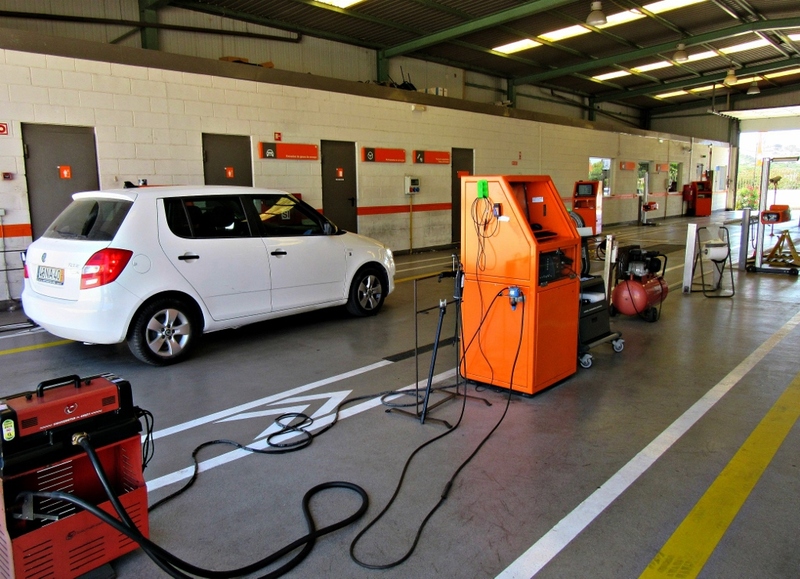 Car Taxes and Road Inspections. We’d bought our spiffy little car, a used, low-mileage, 2012 Skoda, from a reputable dealer for €7500. In Portugal, the license plates come with the car and a road tax is paid annually at the Finanças office. Our cost was about €120. Once a car reaches the grand old age of four, it also needs to be inspected either annually or biannually depending on its age. 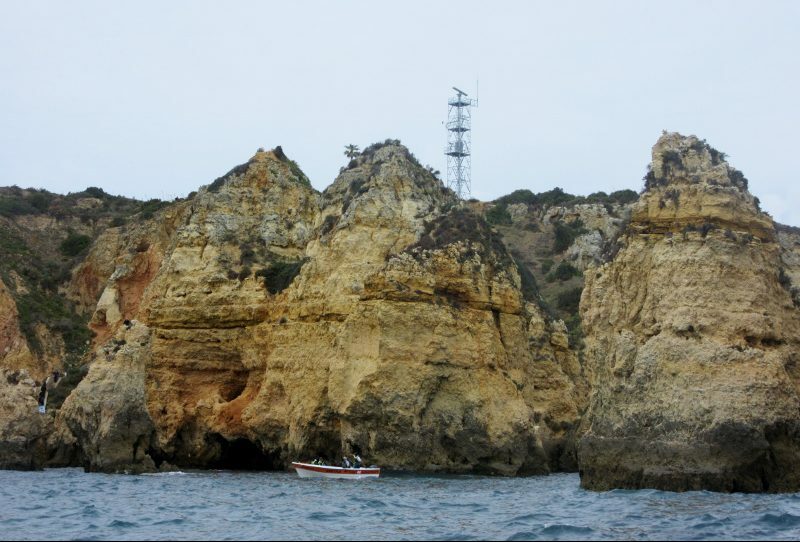 Using a hand-drawn map, we headed out of Lagos toward the town of Sagres for a few kilometers, past the campground, around a few roundabouts until we saw a furniture store and, next to it, our target, the Inspecção Automóvel. We paid the inspection fee of €33 and watched as our baby was poked and prodded, the brakes stomped on repeatedly until we thought we’d have to buy new tires and then shaken, over and over which had us thinking, “This can’t be good.” And it wasn’t … We were given a temporary pass, told to have our shocks replaced and headlights adjusted (€300) and instructed by the unsmiling technician to return within the 30-day grace period. A final re-inspection fee of €8 (and a smile at last) confirmed our car’s continued road worthiness for another two years. Portuguese Driver’s License. We haven’t quite figured out what to do here. As residents, we’re supposed to have a Portuguese driver’s license but we understand that we have to exchange our US licenses. In the US, a license is necessary for many day-to-day transactions. Since we travel to the US and also drive, we don’t want to surrender our licenses. 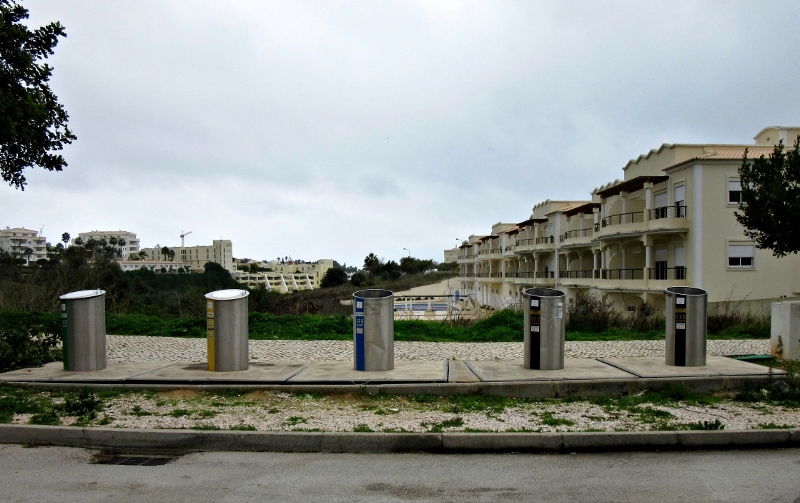 We’ve talked to several Brits who have lived here for years and have yet to find anyone who has exchanged their licenses. So, for now, this issue is unresolved. Looking back at this lengthy tome we’ve written has us thinking “We should have done this months ago” in more manageable posts! For those of you with questions about becoming a resident in Portugal, hopefully this provides more information and didn’t induce too many yawns. For those of you happy where you are, we hope we’ve impressed you with our dogged determination to master our lives in a foreign country. Every day we’re reminded in many small ways that, “We ain’t in Kansas anymore.” Things are done differently here in Portugal but the extra effort is definitely worth it. 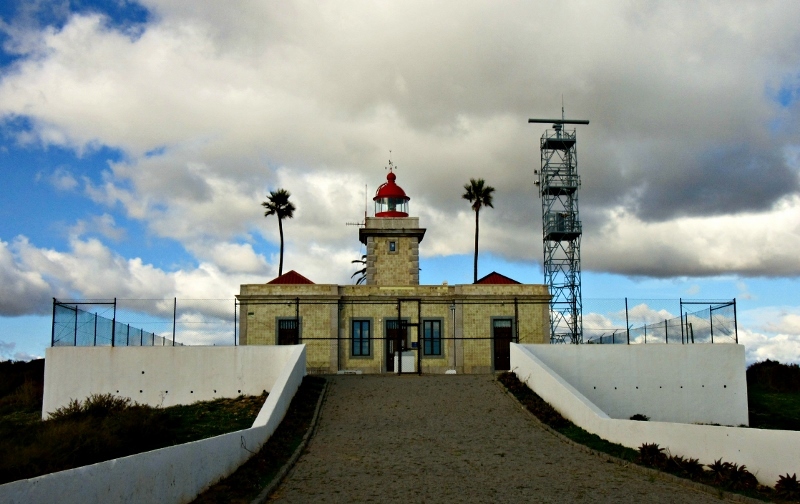 Next Post: Continuing with the “We ain’t in Kansas anymore” theme, we’ll talk about some of the things, for better or not, that are different here in Portugal. We spend a lot of our time as travelers imagining. Imagining what it might be like to live as a modern day Bedouin in Jordan, a Berber in Morocco, a farmer or fisherman eking out a living in Nicaragua, Vietnam or Russia. We have no problems at all imagining where we would go if money were no object or the style in which we would travel. And, since we both have a passion for history, we imagine what it would have been like to live at the height of the Mayan or Incan civilizations, travel along the Silk Road or learn about wondrous new places during the time when the New World was being mapped in the Age of Discovery. Wikipedia has a surprisingly long list of castles and fortresses that are located in Portugal and ruins dating all the way back to the Romans and even earlier. So it’s easy to for us to close our eyes and imagine the lives of the nobility and history’s “social influencers” – what it would be like to stride our way through one of the great halls, feast at a grand banquet in one of the dining halls or sleep in one of the bed chambers of these vast estates. It is, however, harder to frame a picture of the day-to-day lives of the common folk who tended the sheep, brought in the crops or sold their wares at the markets. And there’s surprisingly little written on the lifestyles of those wealthy merchants or the “middle class” of Portugal just a few centuries ago. 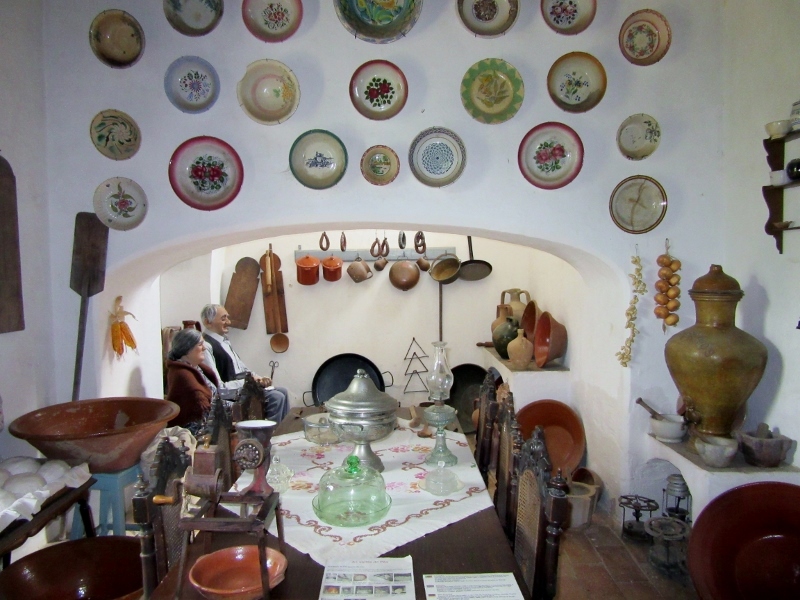 Our chance to find out more about how the common folk and upper-middle class lived came when we took a detour on a recent day trip to Monchique, located in the mountain range of the Serra de Monchique of the Western Algarve. A winding mountain road took us through forests of cork oak and eucalyptus trees, past small farms and the occasional groupings of homes. A sign for Parque da Mina at the edge of the road invited us to take a right-hand turn and piqued our curiosity so we turned and followed the paved road a few meters to a small parking lot. Upon further reading of another sign we found the tempting promise that we could travel back in time and see how one, land-owning family lived in this area of Portugal. 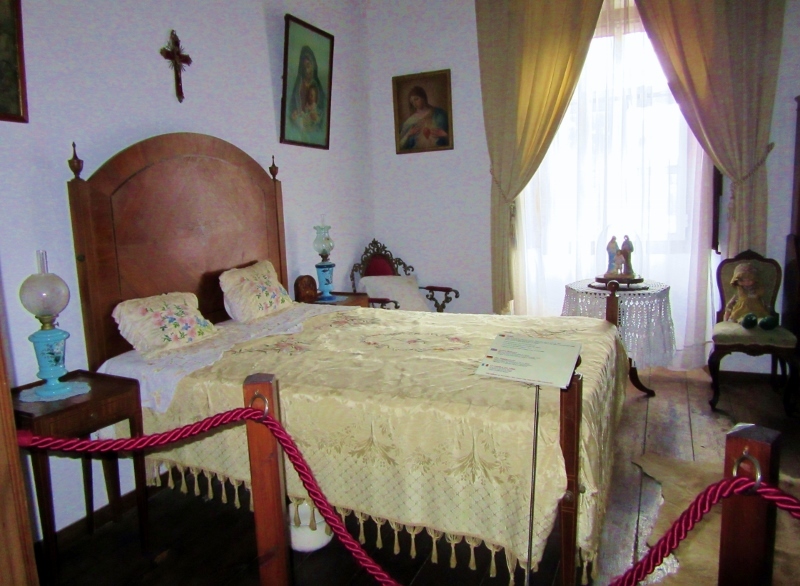 We ponied up the price of 10€ each (which seemed a bit high but goes towards maintaining the property) and set off down the path as it began to lightly rain, towards the family home turned museum and a glimpse of how life was lived many years ago. Our first sight of the 18th century home made it very clear that this was a property lovingly and carefully maintained. 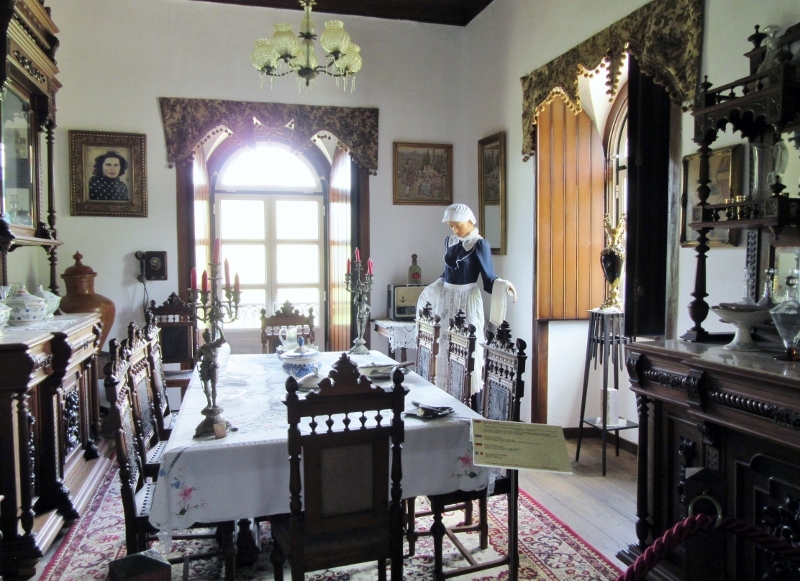 In typical Portuguese fashion, the home has been passed down by the original family through the generations and the current guardians of the estate have generously shared their family history and opened the home as a living museum to the public. And what a treasure! We were welcomed at the door by a smiling woman who gave us an informative tour through the old home that was packed full of practical artifacts used in daily life, some extensive and eclectic collections that reflected the family’s interests and some more modern curiosities like the old Victrola we found in one room. We passed by the sitting room where the family may have sipped some tea and learned of the news of the day from (what seemed to us to be so quaint mixed in with the formal antiques) a vintage radio perched upon the side table. 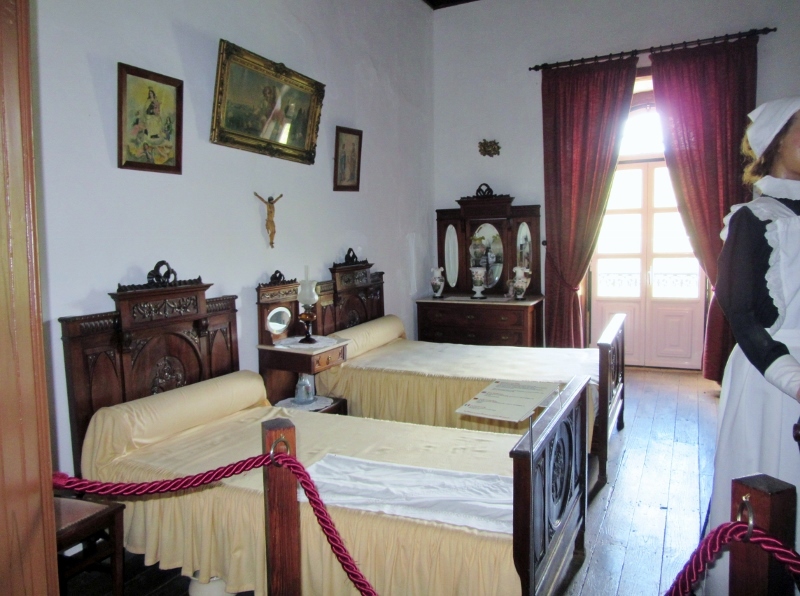 The bedrooms were tastefully decorated and, since Portugal is a traditional Catholic country, the saints protected and watched over the family while they slumbered. And then came our favorite room, obviously where the family must have spent their time together playing music and maybe cards, listening to the Victrola, reading and enjoying the warmth of the fire. 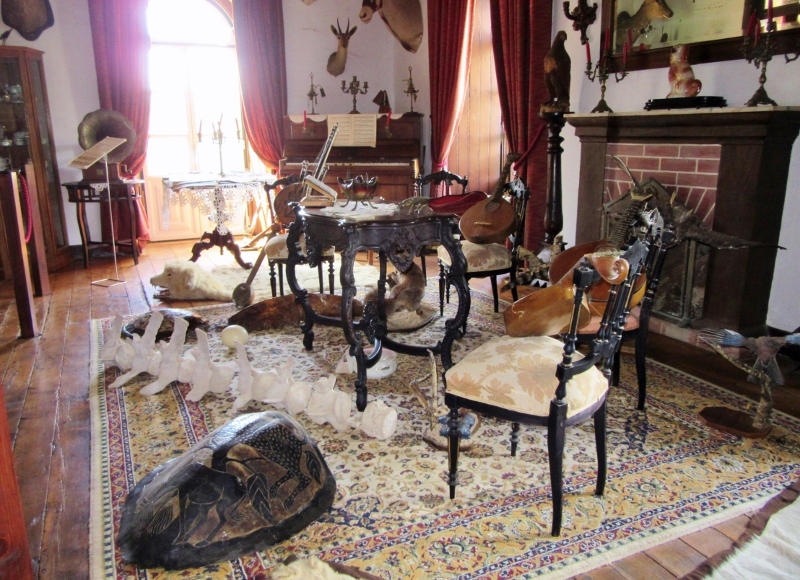 Here was their collection of musical instruments and, a sure sign of how times have changed, several species taxidermied and displayed. A large sea turtle shell stood upon the floor next to the backbone of some huge, unknown mammal. 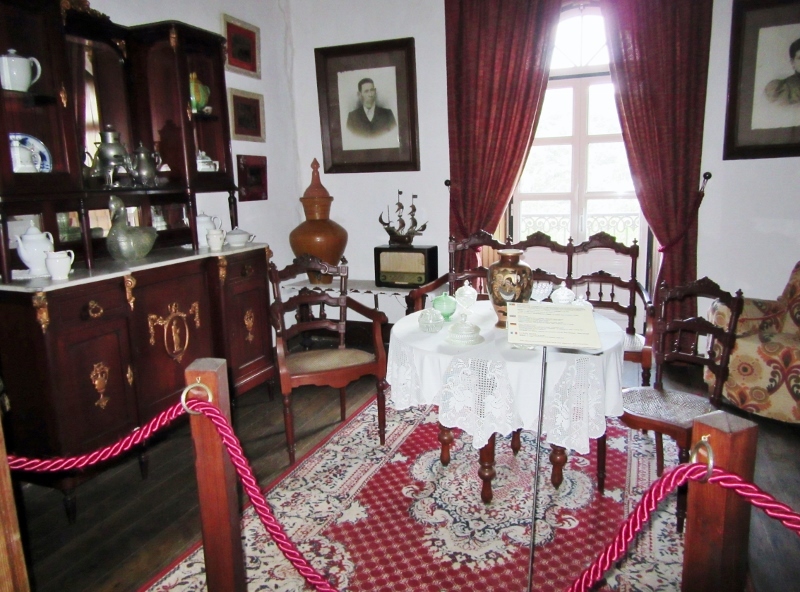 Viewed by today’s cultural norms the display might be a bit macabre but the home would have reflected the tastes of a well-traveled and sophisticated family who enjoyed and celebrated a good life. 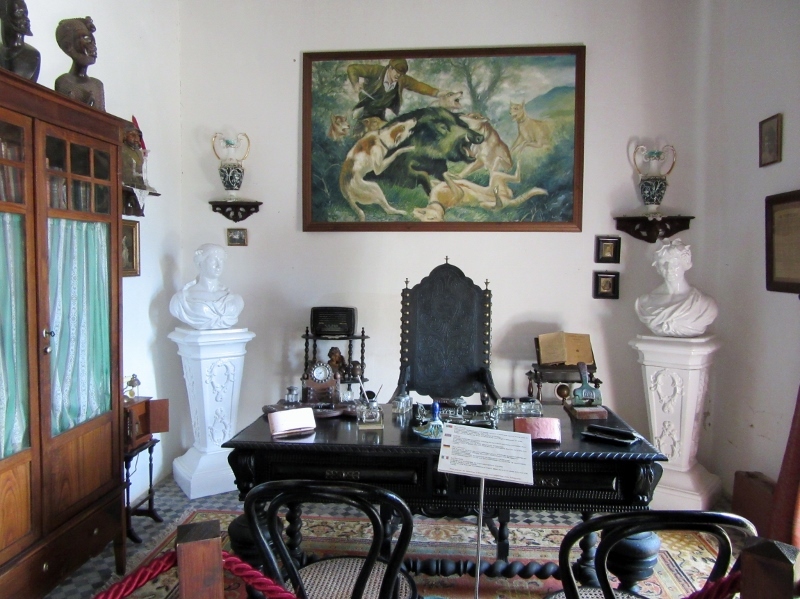 Here and there were nooks with a favorite collection of the patriarch’s pipes, displays of fine china and a whole little room devoted to an enormous assortment of finely carved and embellished, antique wall and table clocks. 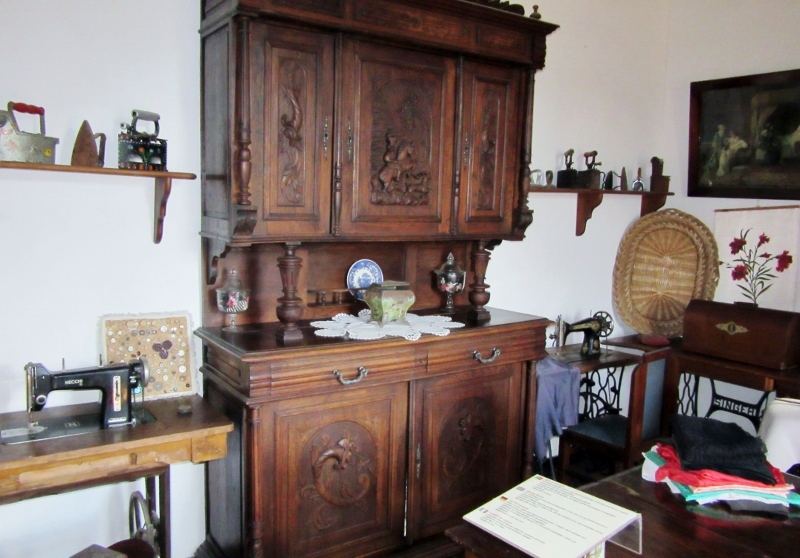 We peeked into a room where the sewing machines and flat irons stood at the ready and learned that all families of means employed their own personal seamstresses. Passing by the office we noticed a colorful painting that, upon closer inspection turned out to be a grisly little scene of hunting dogs bringing down a wild boar and the master with his knife at the ready, lunging in for the kill. A bit removed from the more genteel side of life but another glimpse into times past and the country life of long ago. 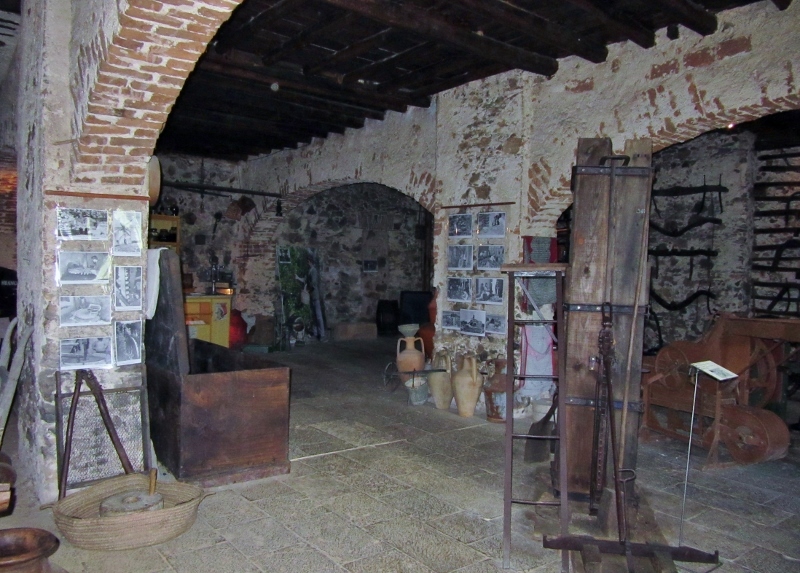 The last part of the tour took us down a winding staircase to the immense cellar with doors giving access to the courtyard and grounds which, again, had several informal exhibits showcasing the different industries that would have been necessary to support the household. 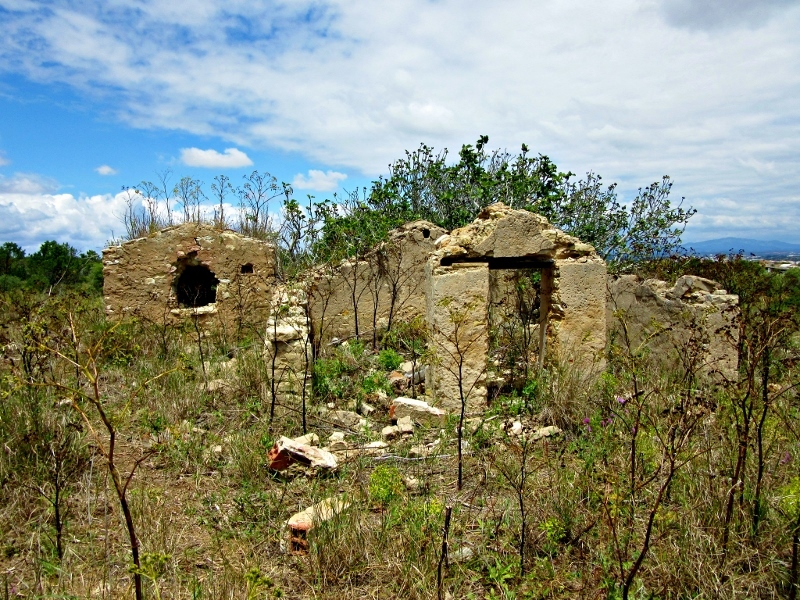 As one of the wealthiest and largest properties in the Monchique region, Parque da Mina had agricultural fields, forests and a working mine that produced iron-ore and copper. 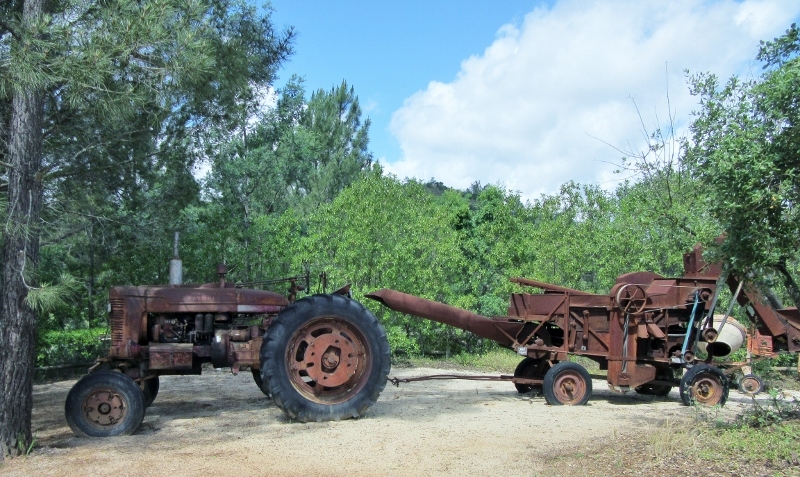 The old trades of the region were showcased in several displays of many fine, old agricultural tools and machines whose uses we couldn’t begin to guess at. 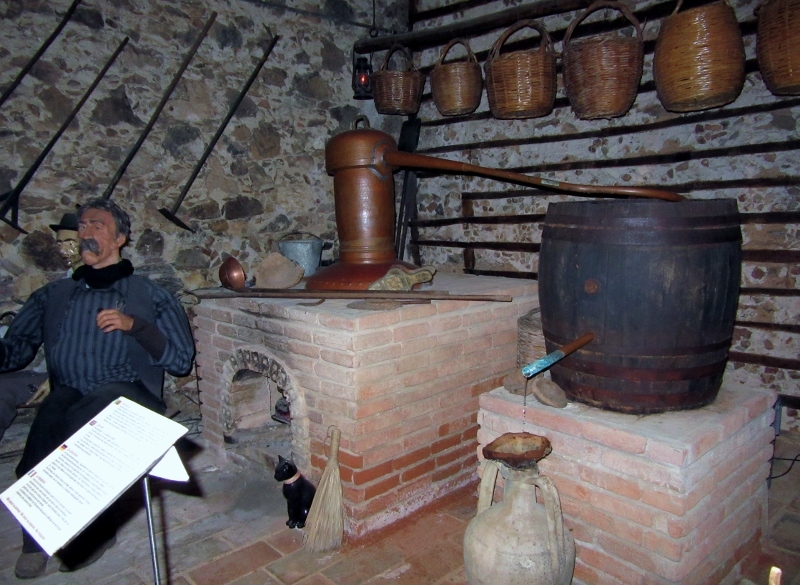 In one corner an animatronic wine maker greeted us in Portuguese and we admired the nearby wine making apparatus and learned about the local liqueur, medronho, made from the fermented berries of the arbutus tree which grows on the property. 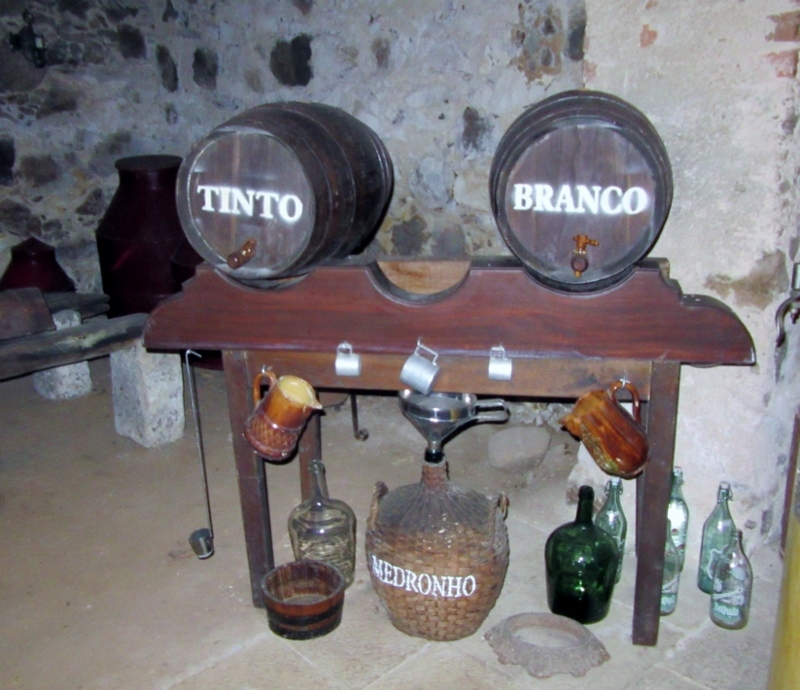 And, in a country where wine flows as abundantly as water, we saw many old barrels and casks used to store vintages of years gone by, some marked branco (white) and tinto (red). 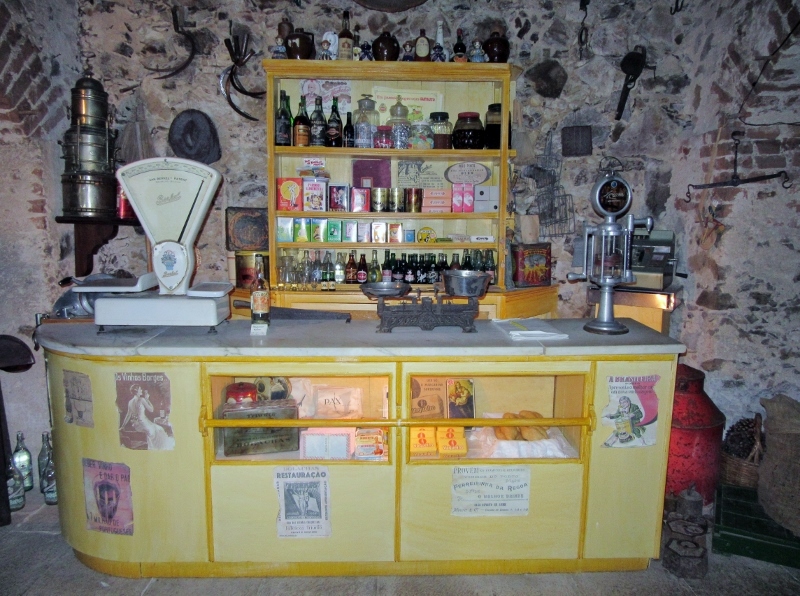 One of our favorite displays was of a general store and its contents that dated (our best guess only) from the 19th and 20th century. 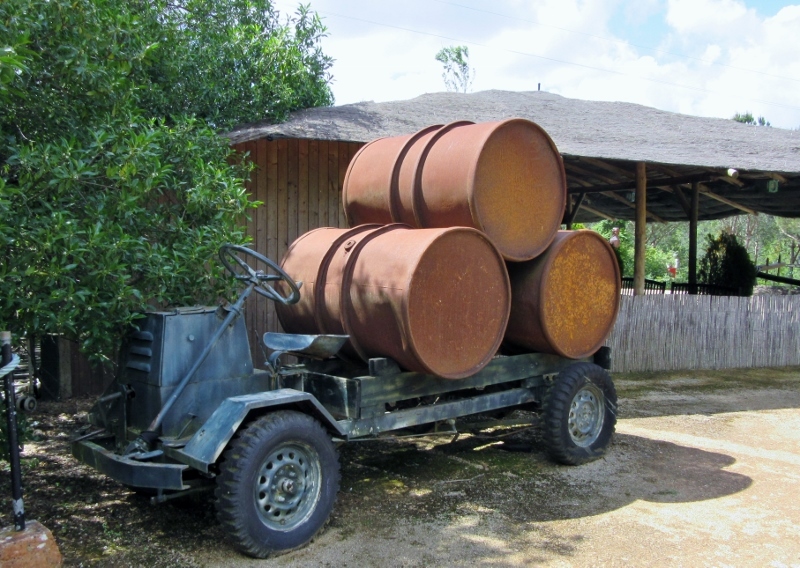 And finally, despite the threat of more rain showers we ventured outside to explore some of the outdoor exhibits and especially liked the old vintage vehicles scattered about the grounds. Sometimes it’s more fun to take a detour to explore a place you’ve never heard of rather than stick to the original plan and, for us, this turned out to be one of those times. 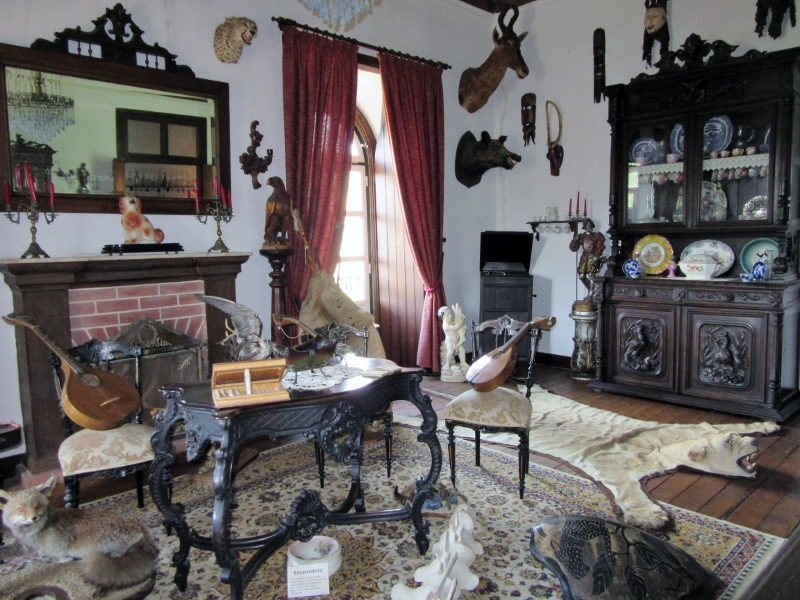 It’s rare to see a historic home so meticulously maintained and to find so many authentic and vintage collections displayed in each room. 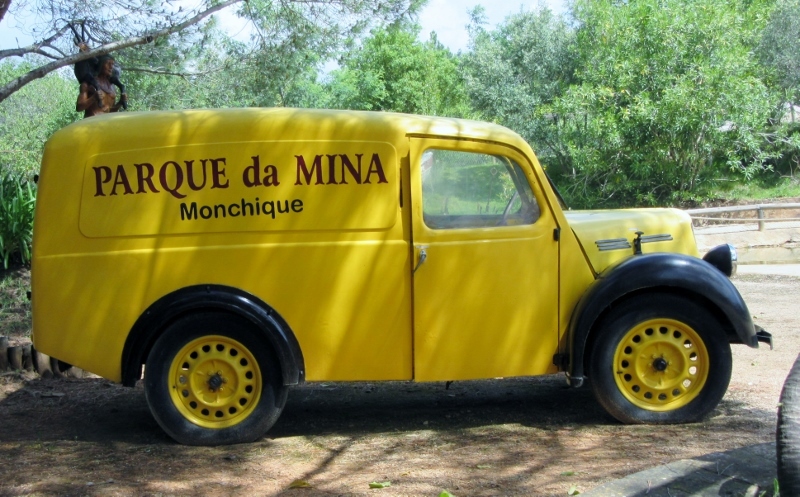 We arrived at our original destination, Monchique, a few hours later than we had planned but very pleased to have taken a trip on the “Way Back” machine and imagine what it might have been like to live in this rural area of Portugal long ago. Ever think about where that cork came from that you just pulled (maybe in pieces) from your wine bottle? If you’re like us, the answer would be a resounding “Never” and maybe a suggestion to “Get a life.” Sometimes an item that we see daily, handle and casually toss away when we’re through with it takes on a whole new significance when we learn more about it. 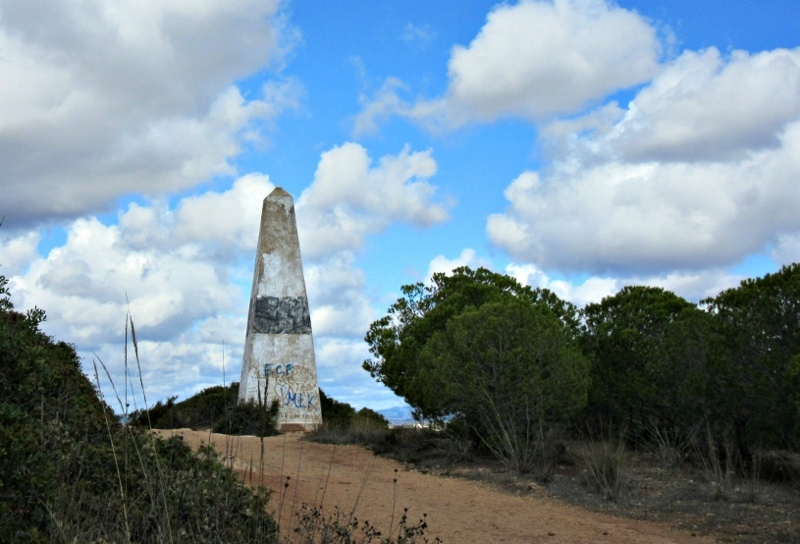 Until we moved to the Algarve Region of Portugal, all we knew about cork was that it was handy to pin notes on, provided a cushioning footbed in our favorite sandals, served as a convenient little coaster to prevent those unsightly rings on our table and lent a festive “Pop!” when pulled from a bottle of quality champagne. 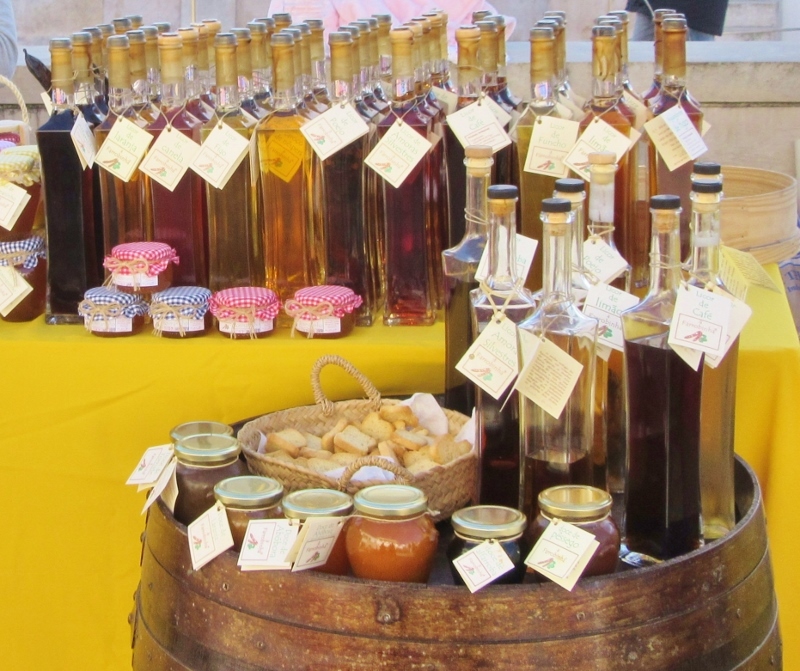 However, in the souvenir shops and vendor stalls found in Lagos and other towns up and down the coast of Portugal, cork products are a big business and you might wonder just what all the fuss is about. Our curiosity was piqued and, when we mentioned our newly found interest in cork (who would have thought?) 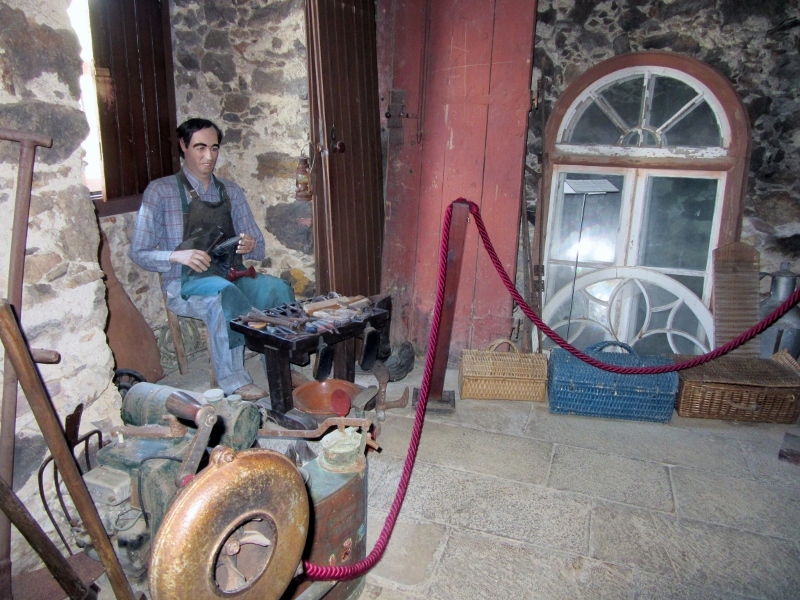 a friend of ours told us about a tour given by the family owned company, Novacortiça Cork Factory. 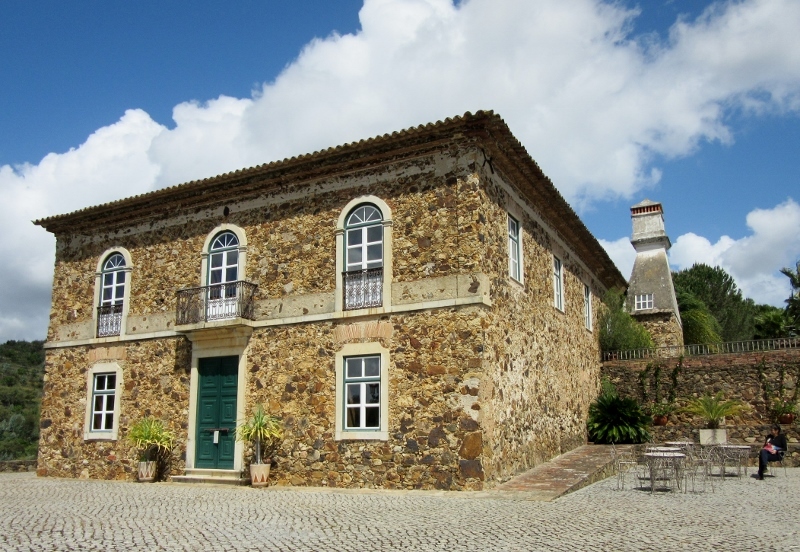 We booked a visit online and set off one morning on a pleasant one-hour drive to nearby São Brás de Alportel, a village in the foothills of the Serra do Caldeirão mountains, regarded by those in the know as one of the best regions of cork in the world. It wasn’t hard to find the place (and yeah, there was a big sign too!) as there were huge piles of tree bark, almost all neatly stacked and baled in the front and along the sides of the building. And the smell? A bit hard to describe but an aromatic combination of sweet and earthy that took us back several years to stacking freshly cut wood for our fireplace. Only better. 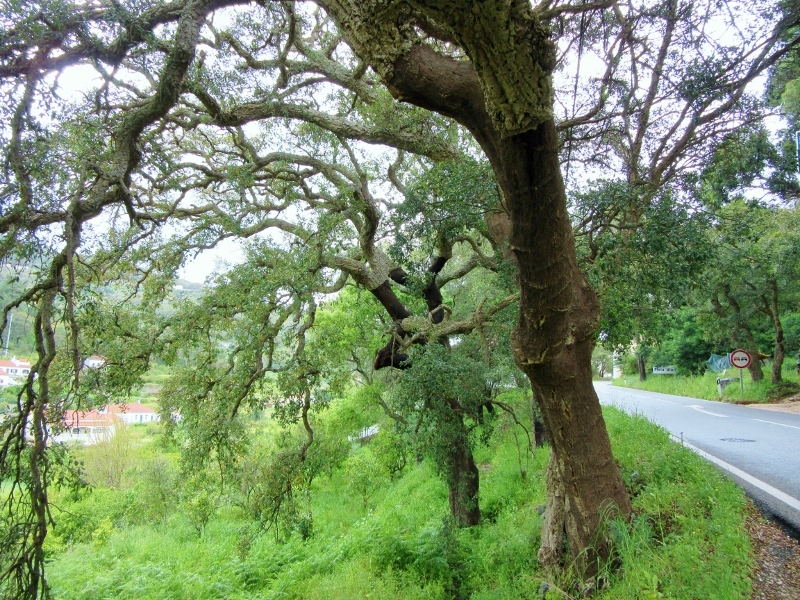 It all starts with Portugal’s national tree, protected by a strict law that makes it illegal to cut down any cork tree in Portugal without permission from the government. It takes twenty-five years for the cork oak to grow large enough for the first stripping of the bark in the hot summer months by a highly skilled cutter, a tirador, who peels away door-sized cuttings using a specifically purposed hand-axe. The virgin cork has an irregular structure and is very rough and brittle, hence its main use is as wall and flooring insulation. 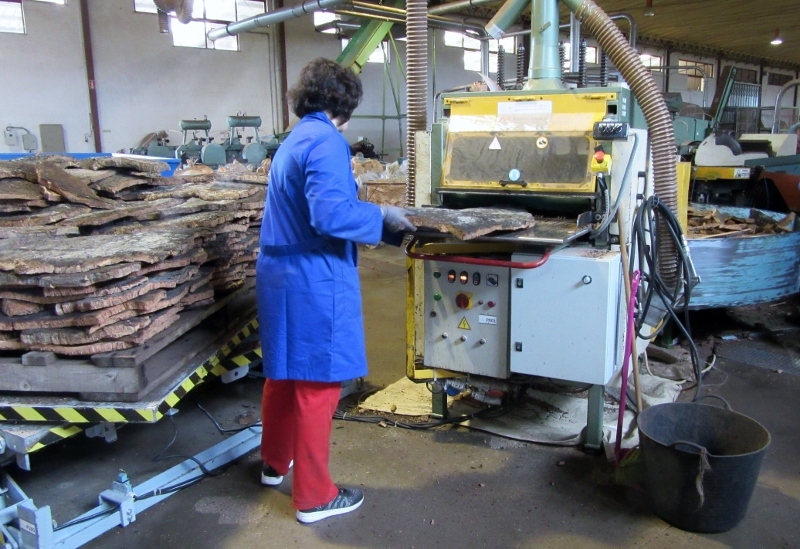 The second cutting, after a period of 9 years or more, in which the outer bark regenerates, yields a denser bark but it isn’t until the third cutting, that occurs any time after the tree is 43 years old, that a high quality cork, compressed and pliable and suitable for wine stoppers, is finally harvested. Which makes the Portuguese saying, “Plant a cork oak for your grandchildren” easy to understand. And, since the trees can live up to 250 years old and yield a harvest every nine years (the year of the stripping is painted on the bark) they can be a valuable heritage for many future generations. Cork oaks are never completely stripped. Different areas of the tree can be harvested at different intervals. We sat through a well-presented lecture about how cork is processed and wine stoppers are made before our tour of the plant and asked so many questions that the German couple next to us started giving us dirty looks that perfectly conveyed the meaning, “Let’s get a move-on, you nerds!” as well as “Get a life.” Once the actual tour started we still asked questions but tried not to embarrass ourselves further while we racked up “most fascinated tourist” points with our guide. The pieces of harvested cork are boiled to remove dirt and insects which also softens it and makes it easier to work with. 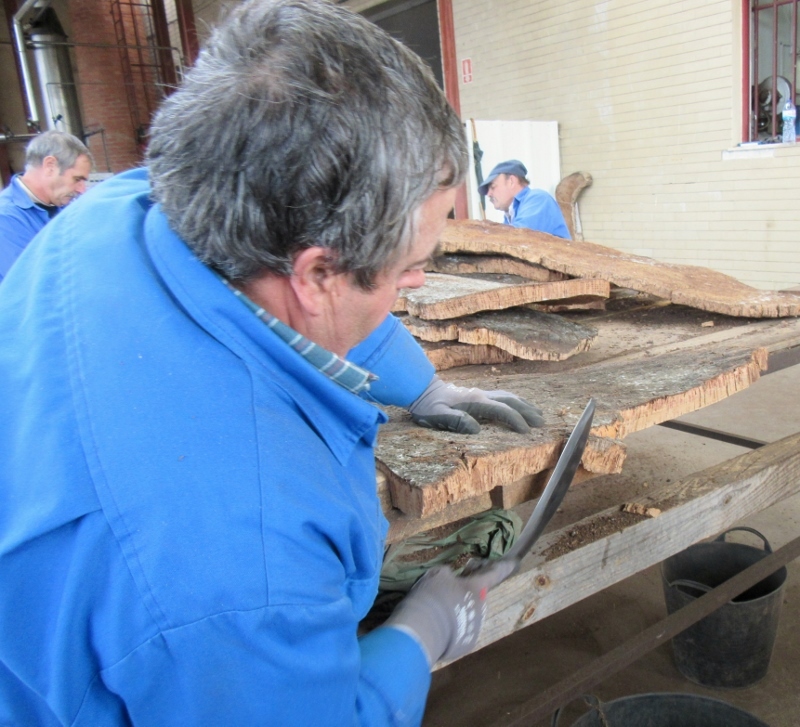 The rough outer layer of bark is removed by hand. The planks are sorted by quality and thickness and cut into pieces that make them easier to work with. Whole bottle stoppers or the discs that comprise the “technical corks” can be hand or machine punched . 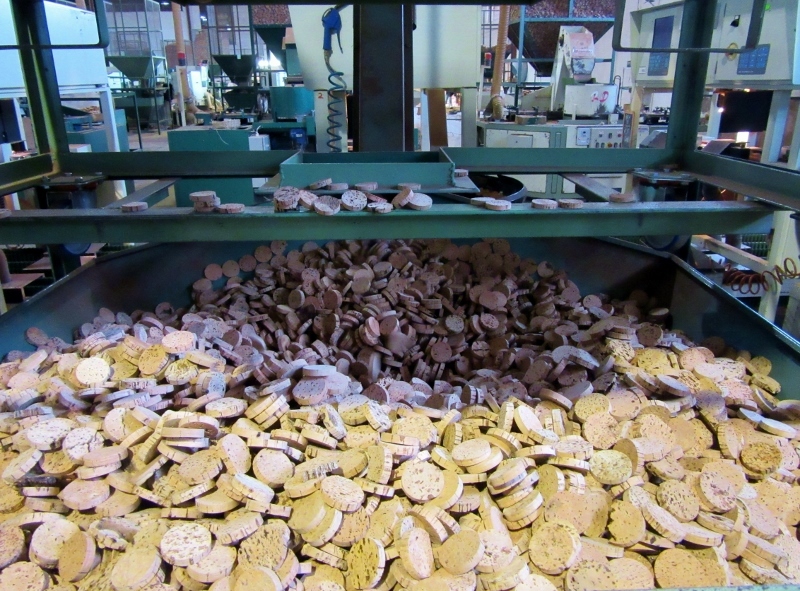 The majority of Novacortica Cork Factory’s end product are the discs for the more economical “technical corks” or “one-plus-one corks.” A cylinder of agglomerate cork comprises the center of the bottle stopper with a disc of natural cork at each end. The disc portion of the cork is what comes into contact with the wine so that the taste is not tainted. 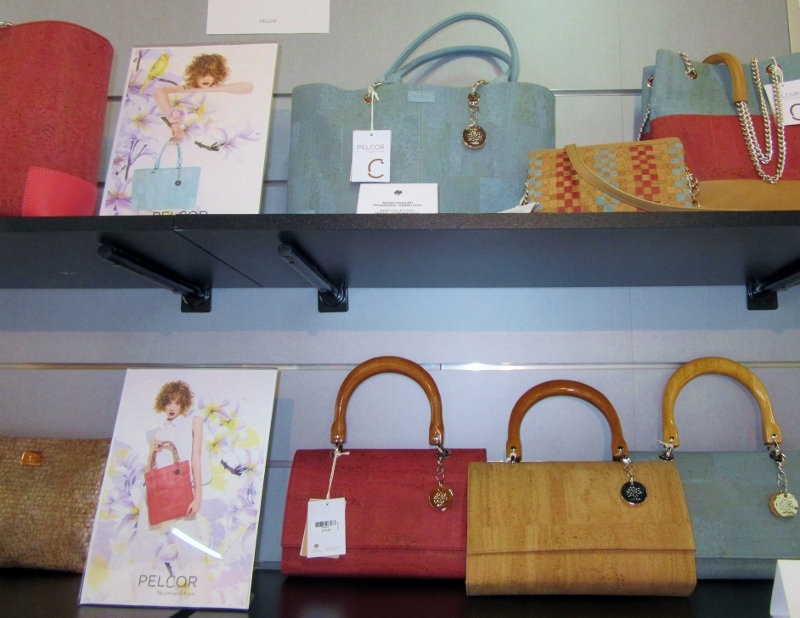 The beauty of any product made with cork is that there is no waste. 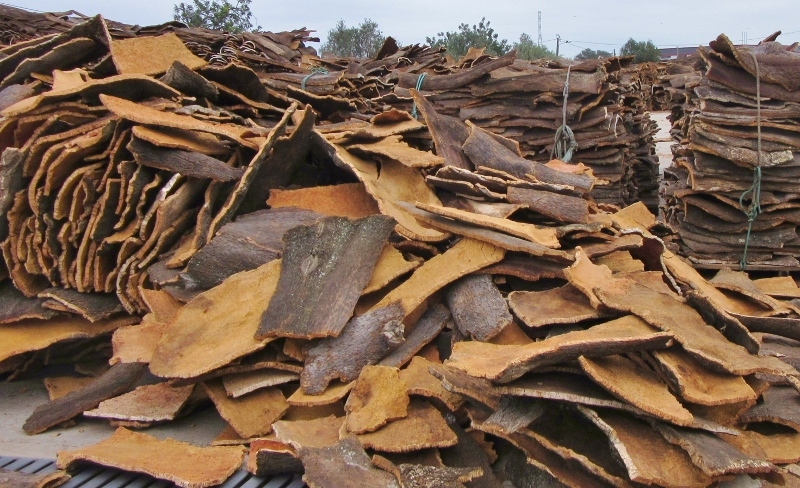 Any cork scrap can be ground up, molded into large blocks or pressed into sheets to make fabrics and upholstery, handbags, shoes, hats, flooring, fishing floats and even surfboards. It can be textured, dyed and burned. It’s completely natural, completely renewable and completely recyclable. We can honestly say we’ll never look at a “cork” the same way again! 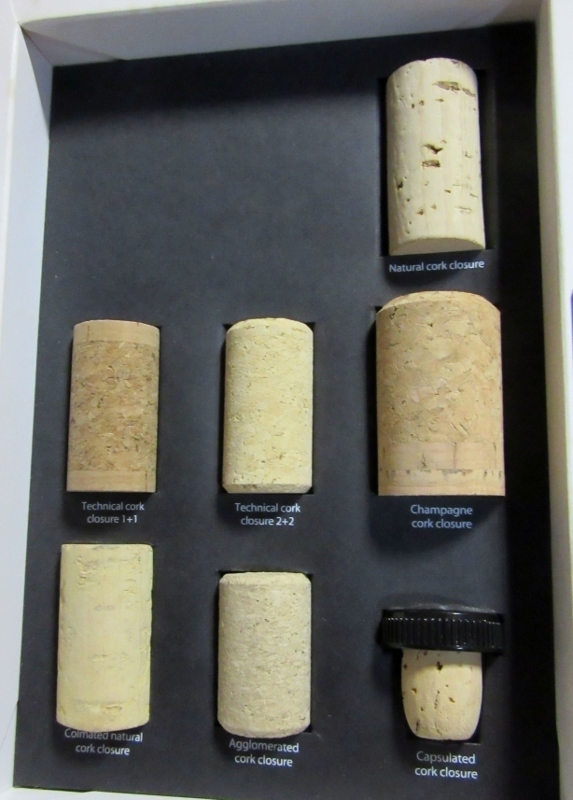 Cork stoppers for different qualities of wine range from 5 cents to 3 euros (about $3.36) for the finest of champagnes. Portugal produces 50% of the world’s cork. 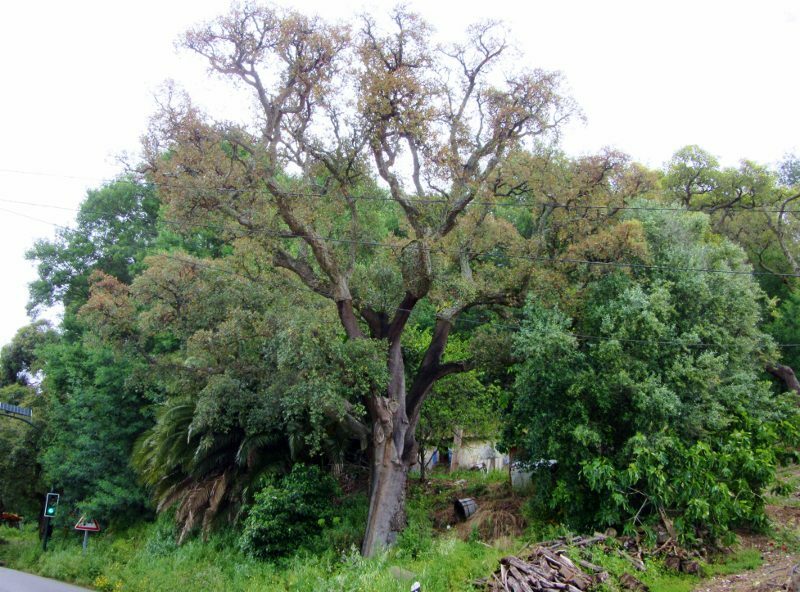 Cork oaks also grow in the Mediterranean climates of Spain, Algeria, Morocco, France, Italy and Tunisia. 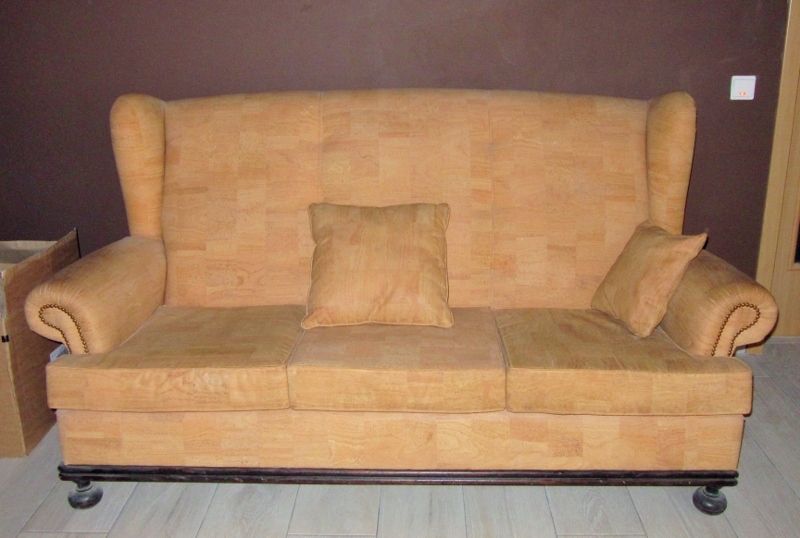 Cork has a honeycomb cell structure which gives it remarkable insulating properties. It’s flexible, compressible and elastic as well as lightweight, impermeable, durable and hypoallergenic. 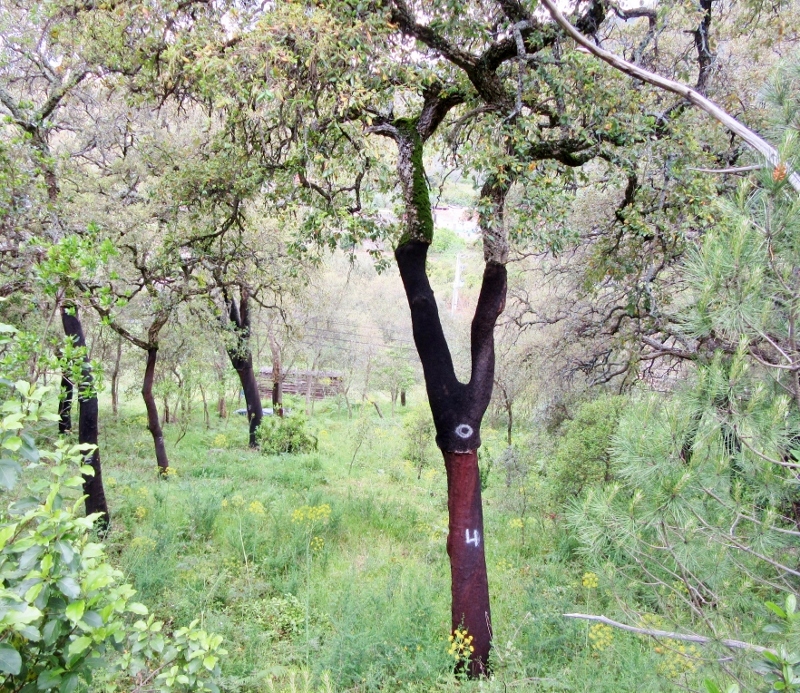 The cork oak forests have been called “Europe’s Amazon forests” and are amazingly biodiverse regions that conserve water and soil as well as provide wildlife habitat. 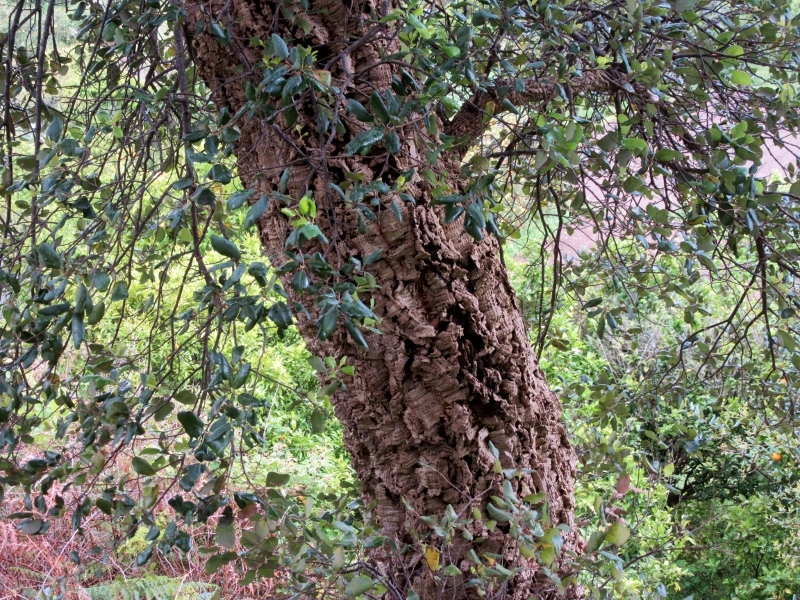 Cork oak trees store carbon (and reduce greenhouse gases) in order to regenerate their bark. And lastly, here’s a link about Wine Corks that has even more fascinating information. Thanks Dyanne at TravelnLass.com for sharing the heads-up with us! 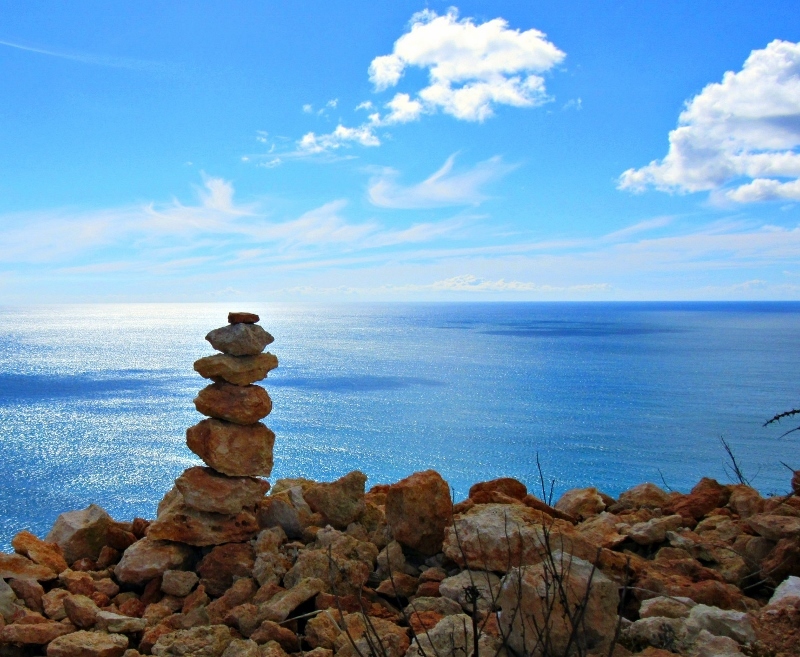 We followed the path alongside the cliffs for a bit, clutching our coats around us against the fierce winds, gazing at the dizzying views and watching the waves hurl themselves against the cliffs. The chill chased us back to the stairs, all 182 of them, that wind down to the bottom of one of the most amazing natural monuments we’ve ever seen where the physical world has played its starring role as a sculptor for thousands of years. Staring down and around and lastly up, as we descended, we kept saying “Wow” in hushed amazement and wonder at the fantastical setting of golden-hued arches, pillars and tunnels, grottoes and other huge, surreal rock formations in pyramidal shapes. The waters’ shades varied from deep blues to turquoise and, with the gray sky and scudding clouds creating a backdrop, rivaled any cathedral we’ve seen. Since our initial visit we’ve made many return trips by ourselves when we’ve needed to add a bit of wonder to our lives. 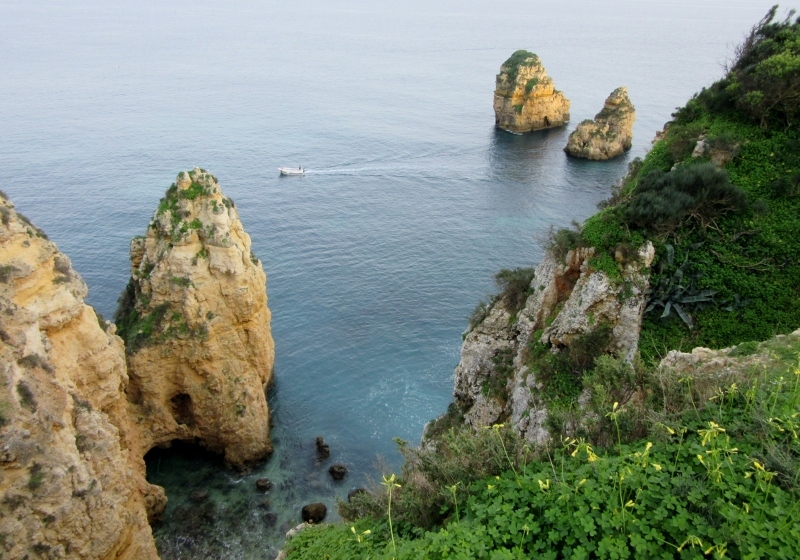 We’ve also made it a point to include Ponta da Piedade as a highlight whenever we get a chance to play tour guides to old and new friends – a spoiler alert for those of you coming to visit us this summer! But, despite several on land visits, it wasn’t until a few weeks ago that we actually took one of the numerous boat tours available with friends visiting from Nicaragua and saw what Huffpost calls “The most beautiful shoreline on earth” from another perspective. 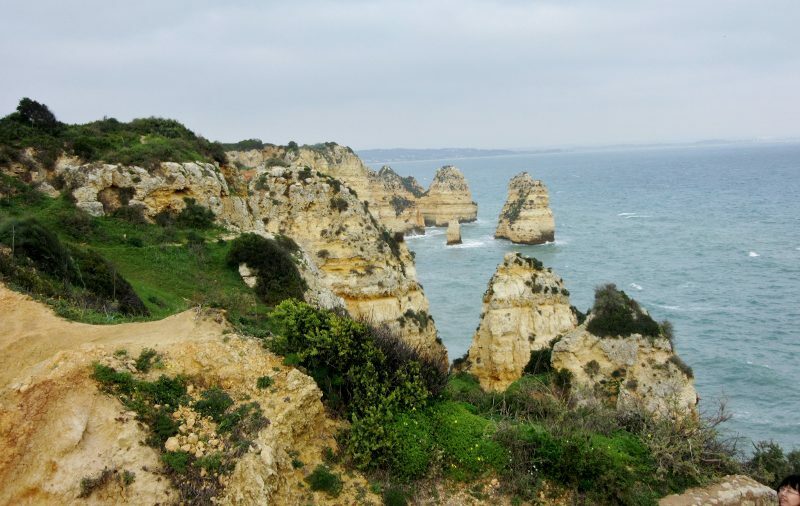 Since we stumbled upon the Ponta da Piedade on a winter day we’ve learned that many regard it as one the most magnificent features along the Algarve coastline and we can enthusiastically add our opinion to this thought. 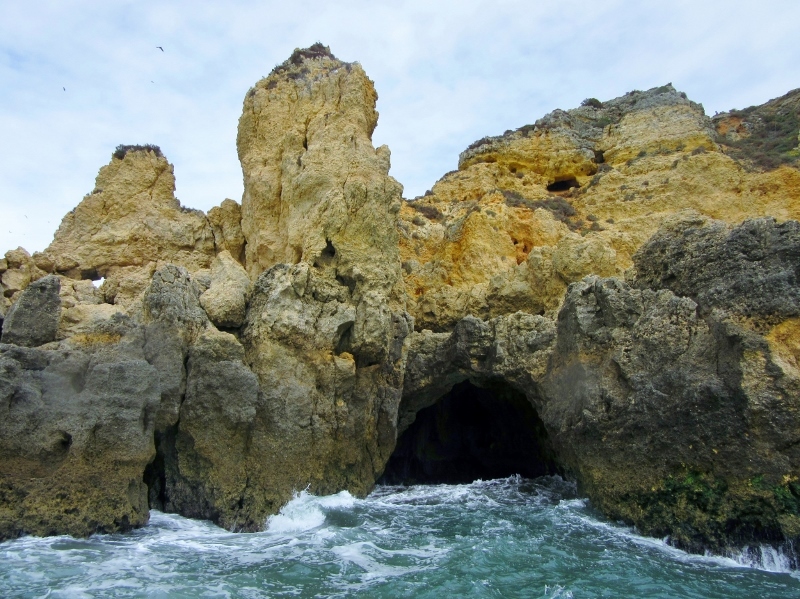 And it’s yet another reason to add to our growing ode of “Things we love about Portugal” and why Lagos could well be the perfect place for us. Note: Boat trips are available from numerous companies in booths and tents that can be found along the walkways near the Lagos Marina. We booked our two-hour trip with Dolphin Seafaris and the cost (low season) was 12.5 € per person. Kayaks and stand-up paddle boards are also available for rent. 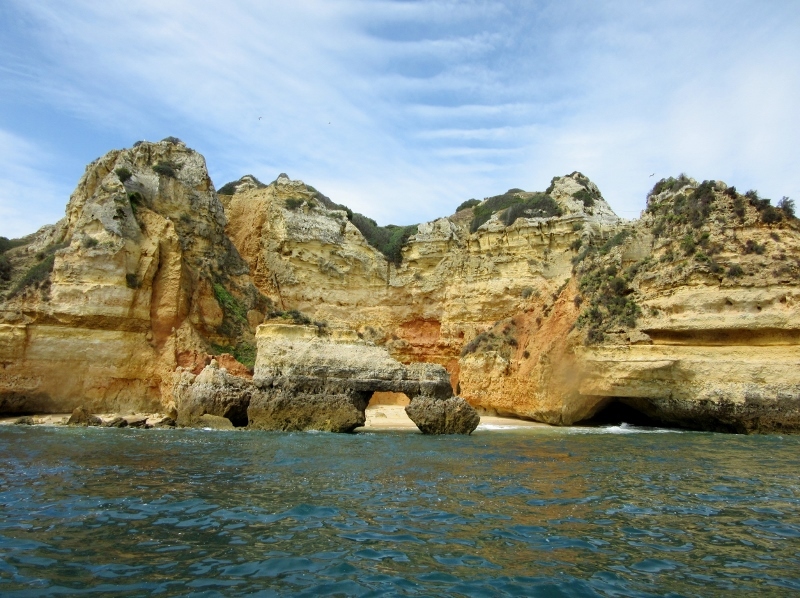 Living La Vida Lagos: How Much Does It REALLY Cost To Live In Lagos, Portugal?